Ted Baker and KMI are delighTED to announce the launch of the new Ted Baker Residence home fragrance collection. Blending impeccable style with unique fragrances, the candles and diffusers are now available in all John Lewis and selected Ted Baker stores across the UK and online at johnlewis.com and tedbaker.com. The new home fragrance collection reflects Ted’s current trend for contemporary colour blocking and uses a rich palette of indulgent burgundy, pretty pink and elegant grey. Block colours are contrasted with a natural finish carton and a delicate rose gold vine pattern inspired by an archived Ted Baker fashion print. Each candle and diffuser is housed in a luxurious weighted glass vessel and available in three carefully crafted fragrances. Choose from the fruity, floral Bergamot & Cassis, the warm and spicy Pink Pepper & Cedarwood and the fresh, green scent of Fig & Olive Blossom. 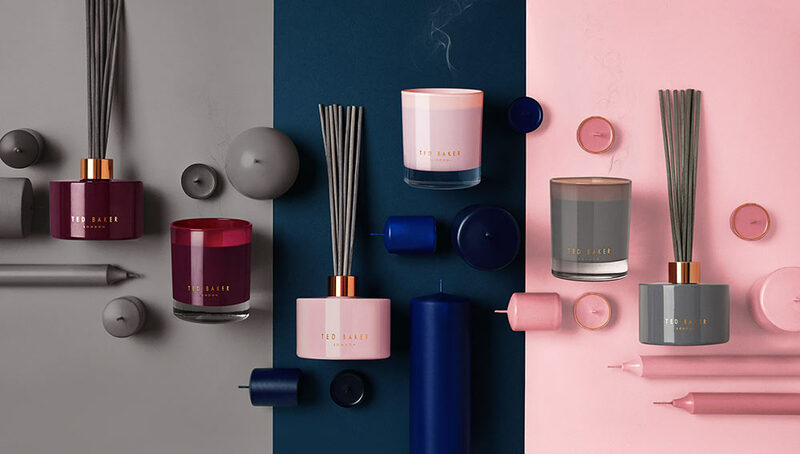 Ted Baker candles are made using a blend of GM free vegetable waxes and double refined mineral waxes, with a burn time of up to 50 hours, priced £28 each. While the reed diffusers are £34 and will last up to three months.